New Endowment (Plan 814) is an evergreen plan from LIC of India, which offers good returns and insurance coverage at moderate premium. It is a conventional, with-profit, non-linked, endowment assurance plan where term of the plan can be chosen as per the wish of the policy holder. The greatest use of an endowment policy is that it can provide you a corpus fund for your future needs such as education and marriage of children, creation of a pension fund etc. Riders such as Accidental death and Disability rider and Critical Illness rider can be added to the plan to get better protection. Maturity benefits of the plan, which include Sum Assured, Accrued Bonus and final Addition Bonus (if any) shall be paid when the plan gets matured after completion of the term. Insurance coverage will be equal to Sum Assured + Accrued Bonus as on the date of death. LIC’s Accidental death and disability benefit, Term rider and Critical illness benefit rider are the optional riders available with the plan. Loan will be available form the policy subject to the payment of at least 3 full years of premium. Income Tax benefits on the premium paid shall be available under sec 80C of income tax act and the entire maturity amount is tax free under section 10(10D) of income tax act. Online Premium and Maturity calculator of New Endowment plan is intended to give you a clear idea on the premium and benefits of the scheme as per the parameters provided by you. It can calculate the premium with and with out riders, such as accident and disability rider, critical illness rider etc. Click the button given below to open premium and maturity calculator. In order to understand the LIC’s New Endowment plan at depth, let us consider an example of a person taking the plan. Let the details of the life assured be as follows. The insurance coverage and other benefits under the scheme will be as follows. Please note that the bonus rates considered for the presentation is as per the latest bonus rates declared by LIC of India. Actual returns of the plans may vary depending on the actual experiences of the corporation. The maturity benefit of LIC’s New endowment plan shall be available after the completion of the term of the policy. The maturity benefit will be the sum of Sum Assured, Accrued Simple Reversionary Bonus and the Final Addition Bonus (if any). There is an option to receive the maturity amount as instalments also through settlement option. Read more on settlement option and how it is useful. Read more: LIC’s Bonus rates and Final Addition Bonus rates for various plans with illustrations and examples. 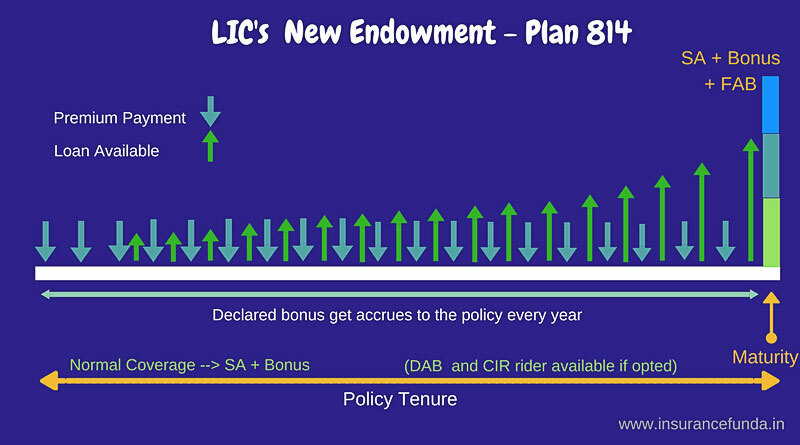 LIC New Endowment Plan – 814 – Income Tax benefit. Premium paid under the plan shall be eligible for income tax benefit under section 80C of income tax act. The maturity amount available from the policy will be tax free under section 10 (10D) of income tax act. Calculate your income tax liability using online income tax calculator. Income tax return e filing. salaried employees guide. If this benefit is opted for, an additional amount equal to Accident Benefit Sum Assured is payable on death due to accident, provided rider is in force at the time of accident. In case of accidental permanent disability (within 180 days from date of accident) an amount equal to AB Sum Assured shall be paid in instalments spread over a period of 10 years and all the further premiums will be waived. Critical Illness rider help to get protected from the financial loss incurring on the occurrence of major diseases to the life assured. On first Diagnosis of any of the 15 critical illnesses listed by LIC, Critical Illness Rider Sum Assured will be paid. Read more on the critical illness benefit rider. This rider help us to get additional insurance coverage along with the coverage provided with the plan, on payment of small extra premium.